Scoop the Bacardi mix into an empty blender. Fill the can ¾ full with tequila. Fill the remaining ¼ of the can with Grand Marnier. Pour the can into the blender. Fill remaining space in the blender with ice. Start blender on lowest speed until ice is crushed, then increase speed until contents are creamy-smooth. 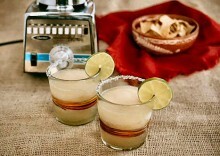 Pour into margarita glasses (using a spoon if necessary) and garnish with lime wedge. Bartender’s hint: We use Jose Cuervo tequila (instead of more expensive “premium” tequilas) as we’ve found it to be the perfect complement to the Bacardi mixer’s smooth flavor. More expensive tequilas don’t necessarily result in a better drink!